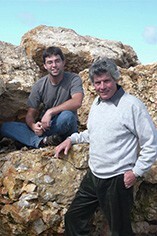 Domaine Cailbourdin was set up from scratch in 1980 by Alain and Carmen Cailbourdin. They now have 16 hectares of Sauvignon Blanc split between the different crus of Pouilly-Fumé and a well-earned reputation as one of the most dedicated growers of this appellation, producing wines with great concentration, purity and intensity of style. Vinifying each parcel separately, Alain tries to bring out the different characteristics of the soil types while emphasising the complexity of the Sauvignon Blanc, a task that starts in the vineyards.